At the age of twenty-four, Winston Churchill was utterly convinced it was his destiny to become prime minister of England. He arrived in South Africa in 1899, valet and crates of vintage wine in tow, to cover the brutal colonial war the British were fighting with Boer rebels and jumpstart his political career. But just two weeks later, Churchill was taken prisoner. Remarkably, he pulled off a daring escape—traversing hundreds of miles of enemy territory, alone, with nothing but a crumpled wad of cash, four slabs of chocolate, and his wits to guide him. 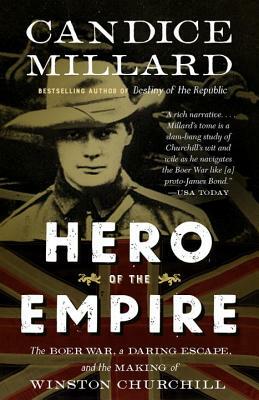 Bestselling author Candice Millard spins an epic story of bravery, savagery, and chance encounters with a cast of historical characters—including Rudyard Kipling, Lord Kitchener, and Mohandas Gandhi—with whom Churchill would later share the world stage. But Hero of the Empire is more than an extraordinary adventure story, for the lessons Churchill took from the Boer War would profoundly affect twentieth century history. CANDICE MILLARD is the author of the New York Times bestsellers The River of Doubt and Destiny of the Republic. She lives in Kansas City with her husband and three children. "A thrilling account...This book is an awesome nail-biter and top-notch character study rolled into one...Could someone be persuaded to make a movie about this episode of his life? I’d watch." "A gripping story...It's a thrilling journey and Millard tells it with gusto."